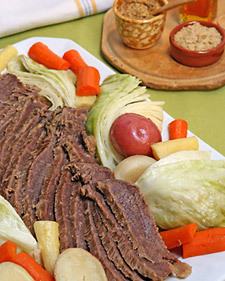 Place the corned beef in a colander in the sink and rinse well under cold running water. Place the corned beef in a large Dutch oven with a tight-fitting lid, add the water, bay leaves, peppercorns, allspice and cloves. Bring to a boil, uncovered, and skim off any scum that rises to the surface. Cover and transfer pan to the oven, and braise until very tender, about 3 hours and 45 minutes.